There is a duck in the bottom right corner. It is asking me whether it can help, absent any indication that I am indeed in need of help. There is no "no thanks, go away" option. The duck asks whether I have a microphone. I click "no" and it starts listening. It asks me to speak up louder. Finally it quacks in frustration. Did we switch target audience to 0-3 years old or something? Edit: Ok, it goes away if you tell it you hate it. Kinda excessive tho. As for the time, it's already April 1st in Kiribati. Last year they tried Dance Dance Authentication, and it was pretty successful. You asked a question which got downvoted or got a close vote? 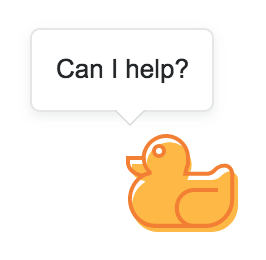 Ducky appears and tells you to verify that the question is in accordance to the help center. You are about to ask a question, which is rather short, or has 150 lines of code in it? Ducky appears and tells you to check with the rules. You gave an answer to a question, which is subsequently closed as duplicate? Ducky comes along and asks you to verify this answer is really needed and whether it might not be better placed at the dupe target if at all. You spend two hours on the site, commenting 20 or more questions without providing any answers? Ducky might pop up and tell you to get some fresh air. "I'm a lazy writer myself, but you know what: 99% percent of questions that contain a single sentence will not be answered." "Wow, did you just manage to give a complete problem description in 2 sentences? You must be the new Einstein. But my experience tell me other people will not understand your condensed writing. Why not consider adapting to their limited minds and stick to the help center rules?" "I know it's tempting to just drop your complete code here. I've done it a few times myself - those questions still have no answer. I guess it's because people do not understand that quakquakquack is a class and quackquak is a number." "It seems people do not like your question. You know what I normally do when that happens to me? I pretend to be one of those humans in front of the screen and read my own question out aloud. Would I understand it if I was one of them? Unfortunately not, humans are so brainy.. they need facts, verifiable examples, previous research and all the stuff from the help center. I wish they could just read my mind like my other duck friends." DUCK: Can I use your microphone? While I realize it's a joke (and a funny one at that), am I the only one that thinks that it could be useful as a guidance tool for newcomers and it could actually help streamline the whole asking the first question process a bit? It certainly catches your eye at least. You can get rid of it per site if you dont like it. Click on I hate this duck if you dont want to see it. 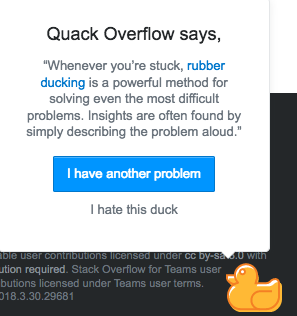 It will show another dialog with a button Goodbye Duck. If you miss the duck later check this answer to make the duck forget what you said to it. We got our ducks in a row for our annual April 1 gag a little late this year; my apologies if anyone though the humor to be a bit fowl. Birds of a feather, our apologies if we flightened anyone. As sincere as this question and subsequent replies have been, I have to admit, y'all really quack me up. But, who knows, duck-typed gags could be a thing of the future ... and maybe this one isn't over yet, even on the second day of the month. You can also get rid of the duck through the Developer Console without having to wait for it to run through its full sequence. Tested in Chrome 65, on SO, unix.SE, and vi.SE (it's a per-site cookie). Does the duck have a name? Sure, for the [python] and [ruby] tags, and even for [c++] when you're doing metaprogramming, "duck typing" is helpful. But [java] users won't trust any typing unless they have a visible name to attach to it. The duck came out of an easter egg. You can get rid of it if you wish, but try not to be unpolite or you'll make him/her cry. It did not work correctly in Internet Explorer, after answering yes/no to the microphone question it just sat there and did nothing and no way to close the speech bubble. I was basically stuck with it for 3 days, thanks guys! it didn't even get the ability to duck! what the duck?! is it a bug? Not the answer you're looking for? Browse other questions tagged support status-bydesign quack-overflow april-fools . What happened to the flag review queue? How do I get the rubber duck back? Why does the direct link to the Ask a Question Wizard lead to a 404 for users who aren't in the test group?